This female African lion (Panthera leo) lives wild at Masai Mara in Kenya, Africa. At the moment she was captured on camera, she was busy relocating her very young cub to another safe and protected location. 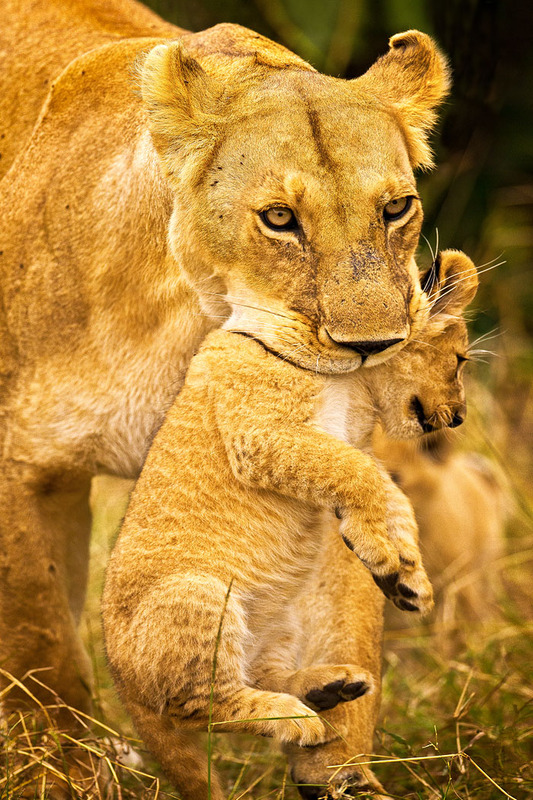 Since lion cubs are born blind, and their eyes generally don't open until they are about a week old, the mother lion stays attentive and protective for at least 6-8 weeks, until she integrates herself and her new young back into the pride. Cubs are helpless at birth, and take around three weeks before they start walking. So the lioness will relocate her cubs to new dens several times. This strategy protects the young in many ways, but mostly it prevents scent build-up, which would draw predators. In this beautifully detailed close-up, this mother lion is caught in the act of stealthily relocating her new cub. This is a special moment that depicts the story of love, dependence and survival in the wild for these incredible big cats.